"Mar Dulce" redirects here. For the album, see Mar Dulce (album). For estuary of the Amazon, see Amazon River. Lake Nicaragua or Cocibolca or Granada (Spanish: Lago de Nicaragua, Lago Cocibolca, Mar Dulce, Gran Lago, Gran Lago Dulce, or Lago de Granada) is a freshwater lake in Nicaragua. 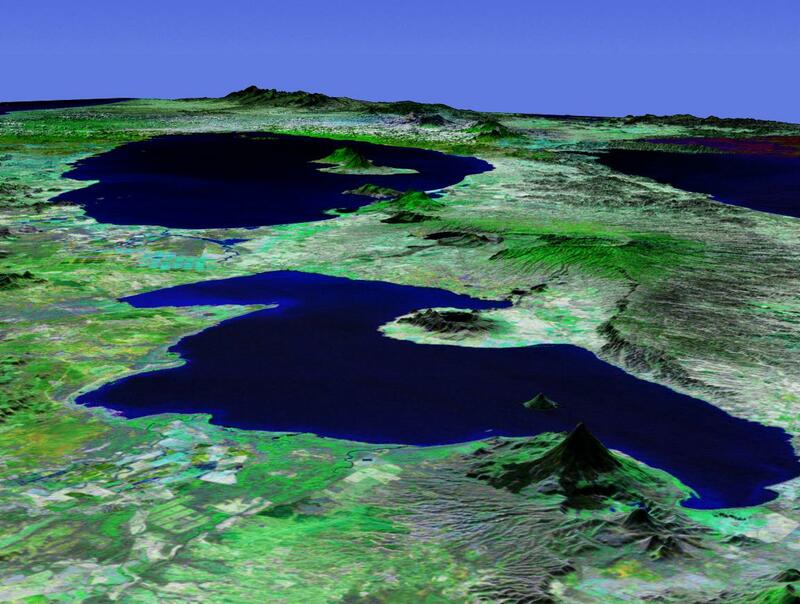 Of tectonic origin and with an area of 8,264 km2 (3,191 sq mi), it is the largest lake in Central America, the 19th largest lake in the world (by area) and the tenth largest in the Americas, slightly smaller than Lake Titicaca. With an elevation of 32.7 metres (107 ft) above sea level, the lake reaches a depth of 26 metres (85 ft). It is intermittently joined by the Tipitapa River to Lake Managua. The lake drains to the Caribbean Sea via the San Juan River, historically making the lakeside city of Granada an Atlantic port, although Granada (as well as the entire lake) is closer to the Pacific Ocean geographically. The Pacific is near enough to be seen from the mountains of Ometepe (an island in the lake). The lake has a history of Caribbean pirates who assaulted Granada on three occasions. Before construction of the Panama Canal, a stagecoach line owned by Cornelius Vanderbilt's Accessory Transit Company connected the lake with the Pacific across the low hills of the narrow Isthmus of Rivas. Plans were made to take advantage of this route to build an interoceanic canal, the Nicaragua Canal, but the Panama Canal was built instead. In order to quell competition with the Panama Canal, the U.S. secured all rights to a canal along this route in the Bryan-Chamorro Treaty of 1916. However, since this treaty was mutually rescinded by the United States and Nicaragua in 1970, the idea of another canal in Nicaragua still periodically resurfaced, such as the Ecocanal proposal. In 2014, the government of Nicaragua offered a 50-year concession to the Hong Kong Nicaragua Canal Development Investment Co. (HKND) to build a canal across Nicaragua at a cost of US$40 billion, with construction beginning in December 2014 and completing in 2019. Protests against the ecological and social effects of the canal as well as questions about financing have led to doubts about the project. Lake Nicaragua, despite being a freshwater lake, has sawfish, tarpon, and sharks. Initially, scientists thought the sharks in the lake belonged to an endemic species, the Lake Nicaragua shark (Carcharhinus nicaraguensis). In 1961, following comparisons of specimens, it was synonymized with the widespread bull shark (C. leucas), a species also known for entering freshwater elsewhere around the world. It had been presumed that the sharks were trapped within the lake, but this was found to be incorrect in the late 1960s, when it was discovered that they were able to jump along the rapids of the San Juan River (which connects Lake Nicaragua and the Caribbean Sea), almost like salmon. As evidence of these movements, bull sharks tagged inside the lake have later been caught in the open ocean (and vice versa), with some taking as little as 7–11 days to complete the journey. Numerous other species of fish live in the lake, including at least 16 cichlids that are endemic to the general region (none are strictly endemic to this lake, although Amphilophus labiatus is native only to the Nicaragua and Managua lakes). A non-native cichlid, a tilapia, is used widely in aquaculture within the lake. Owing to the large amount of waste they produce, and the risk of introducing diseases to which the native fish species have no resistance, they are potentially a serious threat to the lake's ecosystem. Nicaraguans call the Lake Lago Cocibolca or Mar Dulce (literally "Sweet Sea"; in Spanish, "freshwater" is agua dulce). It is the nation's largest source of freshwater. The lake has sizeable waves driven by the easterly winds blowing west to the Pacific Ocean. The lake holds Ometepe and Zapatera, which are both volcanic islands, as well as the archipelago of the Solentiname Islands. The lake has a reputation for periodically powerful, unnavigable storms. In the past 37 years, considerable concern has been expressed about the ecological condition of Lake Nicaragua. In 1981 the Nicaraguan Institute of Natural Resources and the Environment (IRENA) conducted an environmental assessment study and found that half of the water sources sampled were seriously polluted by sewage. It was found that 32 tons (70,000 pounds) of raw sewage were being released into Lake Nicaragua daily. Industry located along the lake's shore had been dumping effluent for an extended period of time. Pennwalt Chemical Corporation was found to be the worst polluter. Nicaragua's economic situation has hampered the building of treatment facilities nationwide (see: Water supply and sanitation in Nicaragua). The country's worst drought in 32 years (as of August 2014) is taking its toll on the lake; the Nicaraguan government has recommended citizens grow and eat iguanas over chickens to reduce water consumption. Also, plans for the Nicaragua canal through the lake could lead to saltwater and other contamination during construction and operation of the canal. According to the plans and geography, the lake is 32 meters above sea level. ^ Salvador Montenegro-Guillén (2003). "Lake Cocibolca/Nicaragua" (PDF). Lake Basin Management Initiative: Experience and Lessons Learned Brief. LBMI Regional Workshop for Europe, Central Asia and the Americas. Saint Michael's College, Colchester, Vermont. pp. 1–29. Retrieved 2014-01-01. ^ a b "Cocibolca (Nicaragua)". LakeNet. Retrieved 2009-01-14. ^ "History of Granada: The oldest city in Central America". Granada Nicaragua. Retrieved 2009-01-14. ^ Oakland Ross, "Nicaragua-Chinese partnership announces planned route for proposed inter-oceanic canal" Archived 2014-09-03 at the Wayback Machine, The World Daily Blog (thestar.com), Jul 14 2014. Accessed Oct 27, 2014. ^ W. Alejandro Sanchez, "Protests against Nicaragua’s ambitious canal", voxxi.com, Oct 26, 2014. ^ a b Fresh Waters: Unexpected Haunts. elasmo-research.org. Accessed 2008-04-06. ^ Colodney, D: The Cichlids of Lake Nicaragua – Part I. Badman's Tropical Fish. Retrieved 26 December 2014. Wikimedia Commons has media related to Lake Nicaragua.